Donald Knuth, Founding Artist of Computer Science Donald Knuth is legendary in the computer science world for writing a series of must-have reference books called The Art of Computer Programming. Part cookbook, part textbook, part encyclopedia, these books are also considered by many to be technical and personal works of art. 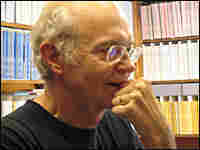 Donald Knuth is legendary in the computer science world for writing a series of must-have reference books called The Art of Computer Programming. Part cookbook, part textbook, part encyclopedia, these books are also considered by many to be technical and personal works of art. This report incorrectly states that 256 is written like 10 million (or a 1 followed by 7 zeroes). It looks like 100 million, or a 1 followed by 8 zeroes.